Announced at the end of 2006, the Nikon D40 is the new entry-level replacement for the Nikon D50. Like the D50, the new D40 is a 6 megapixel camera (this is one of the ways that Nikon kept the price down). 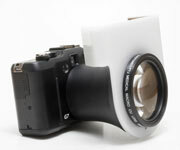 Unlike the D50, the D40 features the same 2.5" LCD screen and the updated menuing system from the D80 and D200. One surprise was the lack of an internal focus drive motor. This means that there is no mechanical focus drive pin - there are only CPU contacts for use with AF-S and AF-I Nikon mount lenses (lenses with internal focus motors). 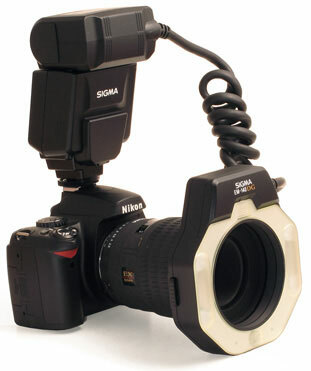 You can attach any Nikon AF lens to the camera, but unless it is AF-S or AF-I, you can only use it in manual focus mode. LED Dental’s new VELscope allows quick and easy detection of mucosal diseases, but until now, it has been difficult (if not impossible) to get clear, sharp images through the VELscope. The reason it is so difficult is the VELscope uses a very narrow section of the visible light spectrum and the amount of light reaching the camera is very small. In order to get images that are of clinical value, there is a very specific protocol that must be followed when taking the images and then the images are processed so that they show the areas of interest - with detail that is expected by medical journals. Canon surprised everyone with the announcement of a new G-Series digital camera. We have had great success with our Canon G cameras and it appeared that the G6 was going to be the last one. 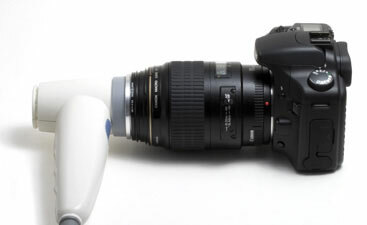 The new G7 is a 10 megapixel camera outfited with a 6x optical zoom lens (35-210mm equiv.). When combined with our closeup attachment kit, the G7 allow you to photograph an area approimately 9/10 " wide (same as SLR digitals). our 5D and 30D pages. We'll be in booth #345 at the Chicago Dental Society Meeting, Feb. 23-25.
new cameras and ask about our CDS specials. we should offer? Let us know! We are always looking for new ways to help our doctors.